The other thing I’ve been doing is drooling (not from heat sleeping this time). 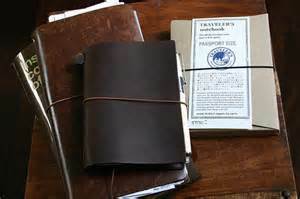 No, this drooling is over the Midori Traveler’s Notebooks. I want one. I really, really would like to have one. Not that I need one. Or that I could justify the cost of one. I just want to have one. So color my creative side excited when I received the latest blog from Debbie-Anne Parent’s Ephemera’s Vintage Garden site and she has put up a video on how to make your own version of the notebook. Not only that but she directs the viewer towards another video with even more detail. After watching both videos I screwed up the courage to dismantle (carefully rip apart) a cool little leather book full of thin blank pagers which has been sitting on my shelf unused for far too long. I made three signatures (sections of pages) for my ‘travelling notebook’ ; one of drawing pages, one of writing pages and one of graph pages. Each signature has 48 usable pages. The fourth section I added was a daily planner I found to fit the 6″ x 4″ notebook. Behind all the signatures I slipped in a back and front pocket page to hold things like receipts and cards. I also included a pen holder (using wide elastic and double-sided tape for the first time so the verdict is still out on that puppy!). I added an elastic bookmark (with button attached as a nod to my sewing). To keep the book closed I’ve attached a loop of round elastic cord. It’s a rough little book inside, but not bad for the first one. And I tried to upload some pictures of my leather baby but my dinkish tool aka my computer, is behaving rather badly at the moment. It has decided to not recognize any of my USB devices today. Yesterday pop-up window were quick to inform me that it couldn’t connect to my printer as I watched my items print out. And quite often it likes to tell me that its sound devices aren’t working—usually when I’m listening to something. Do I think my system is heading for a crash? I’d like to help it along at times. I truly would. But maybe it’s time I did the mature, adultish thing and take it in for a checkup. . . and try to answer their questions without sounding like someone who should never, ever be allowed near a piece of electronics. Sometimes I hate being a grown up. Throwing a tantrum was so much easier.